Our website store has closed and we have rerouted our web address here to our blog, We have retired recently and closed our site. We hope to list what inventory is left on eBay and when we do we will announce it here. For now we will post any updates on our activities here on our blog and on our Facebook page. Happy Soaking! If you are looking for fresh bathroom decorating ideas for your bathroom this spring, try adding some Damask. 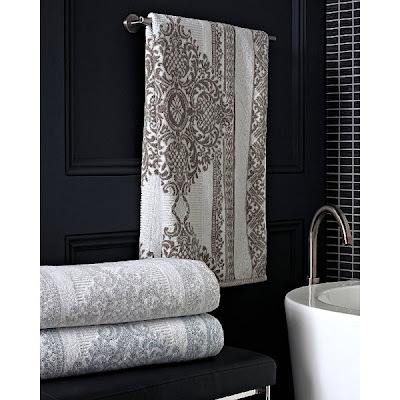 Our NEW Bedminster Damask Bath Towels and Bath Accessories will fit right in with today's design trends with their fresh colors and opulent Damask style. Although Damask goes much further back, this collection looks like it could have come straight out The Great Gatsby with its elegant, opulent, glam glamorous style! But what is old in new again in home decor! DAMASK dates as far back as the middle ages, originating in Damascus. A Damask is a distinct type of ornamental fabric originally woven from bright colored silks sometimes with the addition of gold or other fine metallic threads as well. The traditional Damask fabric had an intricate reversible design created exclusively in the weaving process that usually consisted of flowers, animals, fruits or some other type of ornamental pattern. Damask was originally known as the opulent, luxurious fabric of royalty and the very wealthy but when the Jacquard Loom was invented at the end of the 19th Century Damask began to be mass produced and it's use became widespread. Today Damask can be seen anywhere from tablecloths and wallpaper to wedding dresses and invitations. It's glamorous rich history has followed this fabric and its designs into the 21st century where it has been recreated in many forms including wallpapers, fabrics, table linens, bath towels and home paper products. Damask is coming back in full force will be a great way to update and add some elegance and glamor to your home decor. The Bedminster Damask from Trump Home Collections is right on trend with the comeback of Damask patterns. The Bedminster collection has a unifying medallion Damask pattern that is seen in each of the three collections, but on each a unique way. 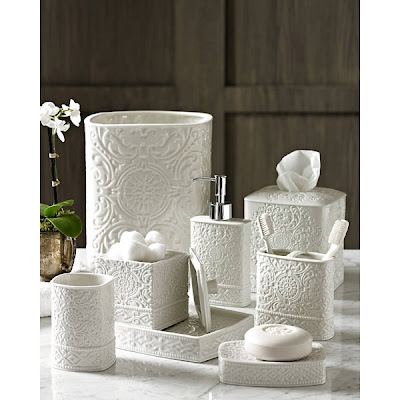 Bedminster Damask Bathroom Accessories: White Porcelain Bath Accessory Set with an intricate medallion pattern embossed into the porcelain. This pattern has been highlighted with a creamy white glaze that accentuates it's fine detail. 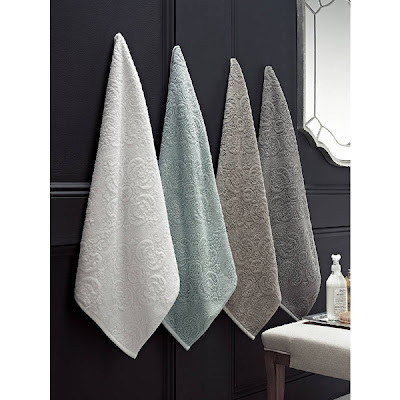 Bedminster Damask Solid Bath Towels: A soft sculpted medallion Damask pattern woven into solid colored Bath Towels The elegant design will add subtle glamour to any bath while the fine ring-spun cotton makes the towels soft, luxurious and ultra-absorbent as well. Available in four vibrant colors that coordinate with other Bedminster Damask collections. Bedminster Damask Stripe Bath Towels: The Damask medallion pattern seen it all it's glory on two-color ring-spun cotton bath towels with soft sculpted stripes surrounding the full medallion pattern on each corner. The colored medallion design on white harkens back to Damasks of years ago with their reversible patterns and elaborate designs. These modern-day Bath Towel masterpieces have all the opulence and luxury of those Damasks of years gone by with all the performance of today's best materials. You can shop for all of the above Bedminster Damask Bath Collections at The Gentle Bath & Company, as well as our other fine bath linens, bath decor and bathroom accessories. We can help you find the perfect match or a new inspiration for your bathroom decor. We always offer Fast & Free Color Samples for all of our Bath Towel Collections, including the New Bedminster Damask. Bath Towel colors can look so different on the computer and there are so many lighting variations on photos that it can be difficult to tell if a towel color will work until you have it in your own home. No more guessing about what would look best in your bathroom, plus save the high cost of Return Shipping. No shipping charges for Sample only orders.